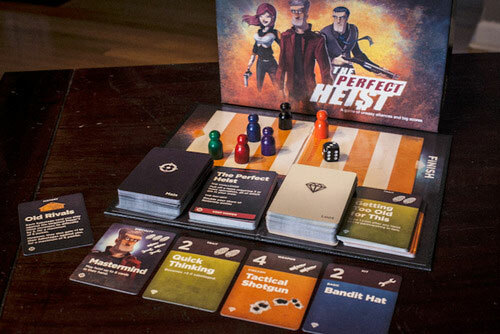 The Perfect Heist is a cooperative/competitive board game based on the heist movie genre. 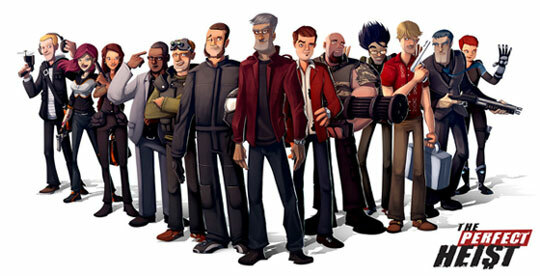 I designed it to capture the excitement and challenge of pulling together a handpicked crew of professionals to pull off epic heists. To win, you must convince your friends—those gunmen, con men, getaway drivers, and grizzled vets who are "getting too old for this"—to join your crew and take on increasingly more difficult jobs ranging from boosting cars to nicking top secret documents and biological weapons. Karl Tiedemann, the creator of the game, gives an overview of the game. I really enjoy this game, in fact I play it once a month with my friends. But in all seriousness this game is best for kids in college, that is when it is the absolute most fun. For family set up it is a little heavy for people who are opposed to playing a board game in general, and often the weakest member of the family will be used as a stepping stone. In combination with even the player farthest behind will actually still play a huge part in this game it may get emotional for people who aren’t mature enough to handle it. 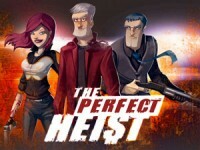 Add a Review for "The Perfect Heist"